This panel of composite images shows part of the unfolding drama of the last stages of the evolution of sun-like stars. Dynamic elongated clouds envelop bubbles of multimillion degree gas produced by high-velocity winds from dying stars. 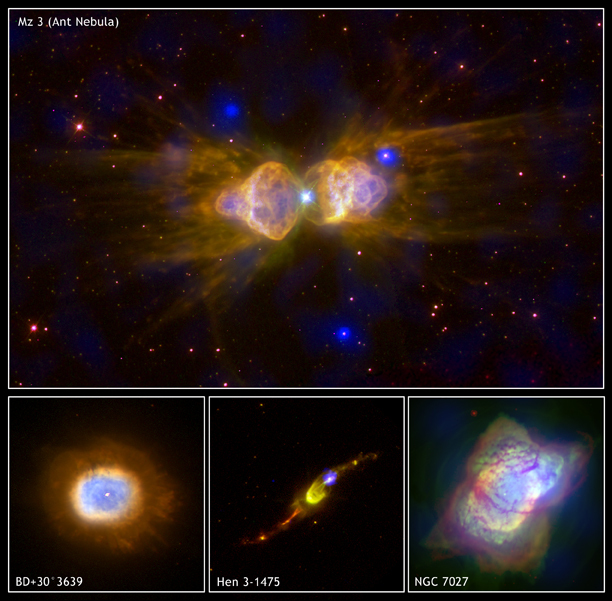 In these images, Chandra's X-ray data are shown in blue, while green and red are optical and infrared data from Hubble. Planetary nebulas — so called because some of them resemble a planet when viewed through a small telescope — are produced in the late stages of a sun-like star's life. After several billion years of stable existence (the sun is 4.5 billion years old and will not enter this phase for about 5 billion more years) a normal star will expand enormously to become a bloated red giant. Over a period of a few hundred thousand years, much of the star's mass is expelled at a relatively slow speed of about 50,000 miles per hour. This mass loss creates a more or less spherical cloud around the star and eventually uncovers the star's blazing hot core. Intense ultraviolet radiation from the core heats the circumstellar gas to ten thousand degrees, and the velocity of the gas flowing away from the star jumps to about a million miles per hour. 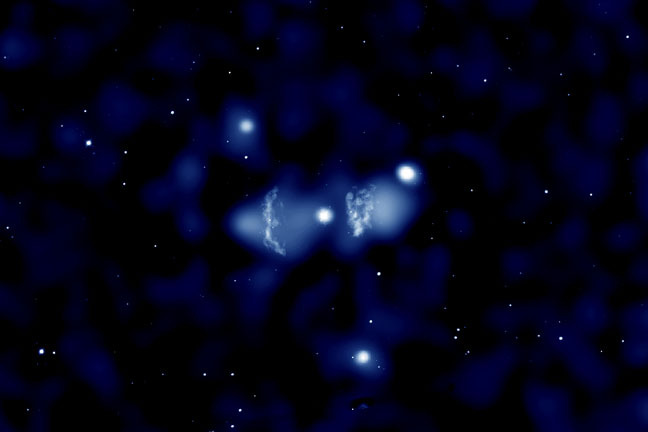 This high speed wind appears to be concentrated into opposing supersonic funnels, and produces the elongated shapes in the early development of planetary nebulas (BD+30-3639 appears spherical, but other observations indicate that it is viewed along the pole.) Shock waves generated by the collision of the high-speed gas with the surrounding cloud create the hot bubbles observed by Chandra. The origin of the funnel-shaped winds is not understood. It may be related to strong, twisted magnetic fields near the hot stellar core. Coordinates (J2000) RA 16h 17m 12.60s | Dec -51° 59´ 08.00"
Coordinates (J2000) RA 19h 34m 45.20s | Dec +30° 30´ 59.10"
Coordinates (J2000) RA 17h 45m 14.20s | Dec -17° 56´ 47.00"